In a striking display of obliviousness, the Trump White House has reportedly asked to screen The Post, Steven Spielberg’s film about The Washington Post’s publication of the Pentagon Papers, a Department Of Defense study that revealed that the United States had remained engaged in the Vietnam War knowing that it couldn’t win. One can only guess at Trump’s motivations: Does he have any idea what it’s about? Is a staffer trying to pull a high-concept prank that Trump probably won’t get? Seriously, though, does he know what this movie is about? Let us help: The Post is about the free press publishing secrets that the government doesn’t want it to. 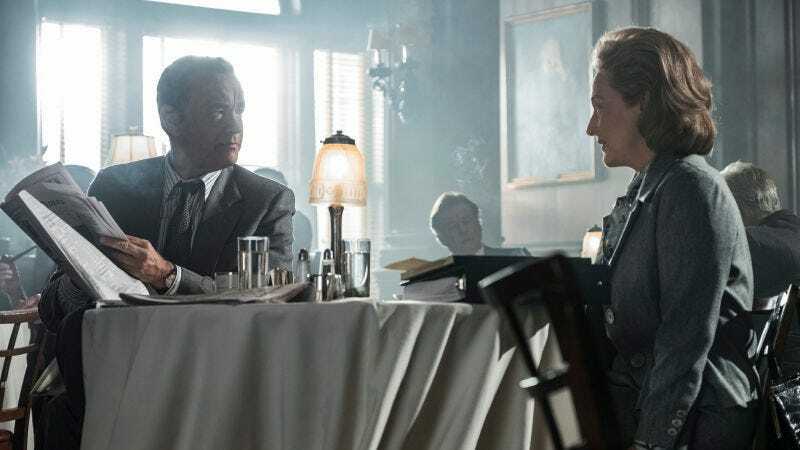 Spielberg focuses on Washington Post executive editor Ben Bradlee (Tom Hanks) and publisher Katharine Graham (Meryl Streep) in a moment of crisis: Do they publish the Pentagon Papers, knowing it could lead to serious legal trouble, on the eve of The Post’s initial public offering? Even if not a great drama (The A.V. Club gave it a C+), the film overtly champions a free press and its role in checking the government—in this case, the Nixon Administration, which has been frequently called into comparison with the Trump Administration. Hanks’ gravel-voiced Bradlee is not particularly subtle in his exclamations to do right by the American people and publish the Department Of Defense’s secret papers (“What will happen if we don’t publish? We will lose! The country will lose!” “If we don’t hold them accountable, who will?”). The Post portrays Nixon at a distance, but in explicit terms: Nobody has witnessed an administration with such a tight grip, or so willing to muster its power to stop its opponents. Perhaps this sounds familiar. The primary players in this film are not exactly Trump sympathizers. Steven Spielberg and wife Kate Capshaw together gave $2.3 million to Hillary Clinton’s presidential campaign, and Meryl Streep and Tom Hanks have given to the Democratic Party for years. Hanks has already preemptively refused any invitation to screen The Post at the White House. Finally: Trump has previously asked for the movies Finding Dory and Why Him. Will he even have the attention span for a two-hour drama?